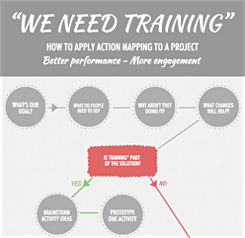 Training design: First make sure training is the best solution! Here’s a flowchart that will help you identify the best solution to a performance problem, whether it’s a job aid, a workflow improvement, training, or something else. 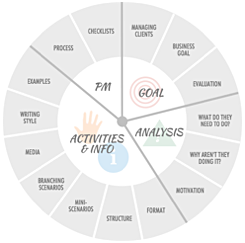 It’s based on action mapping, my streamlined approach to instructional design. First, download the flowchart. It’s available as a PDF in pretty and plain versions. Then consider watching the following 8-minute video, which walks you through a short discussion with a client, showing you how some quick questions can save you days of unnecessary training development. 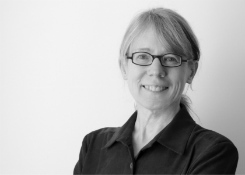 Do you really need to design training? Ask this flowchart. from Cathy Moore on Vimeo. What happens after the video? These are permanent workflow improvements that avoid the need for training. At this point, the only training we’re going to develop is a very compact activity on identifying last names. It could probably be posted on the intranet with a link sent to everyone through email. If we hadn’t used the flowchart and had simply obeyed our client’s request for training, we’d spend a lot more time developing something a lot less useful. We’d probably create an online course that starts with “Welcome to the course on completing TPS records.” We’d list objectives like, “At the completion of this course, you will be able to enter the correct XR code…” We’d probably “motivate” the learners by talking about the importance of completing the record properly and describing the costs of having our records rejected. Then we’d tell people what they already know — that they have to log in to the annoying server to see the XR codes. We’d probably walk them through it “to make sure everyone knows how” and lecture them on the importance of using the updated sheet. To “teach” the rules for flagging records, we’d probably display a chart of rules, give some examples, and then quiz the learners on whether they can remember the information that they saw five seconds ago and which they will forget by tomorrow if not later today. Finally, we’d include a little activity to help them practice identifying last names. Within a month, we’d discover that people are still printing out the XR code sheet and failing to flag records properly. Instead, just by asking some questions, we’ve helped the client identify permanent improvements, and we’ve freed up enough time to do a good job on the little name activity. The time that we don’t spend on creating unnecessary training becomes time we can invest on designing much higher quality activities. This is great Cathy! You put a process that we may already go through in a clear, succinct way. Very useful – thanks! This was FAB! As usual, you break down all the theory and analysis into real-world application. This flowchart dovetails nicely with Bob Mosher’s and Conrad Gottredson’s concepts of embedded performance support. Thanks for this Cathy. 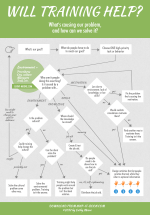 What software did you use to create the flowchart? It was very effective. Thanks, everyone, for your comments. Linda, I’m on a Mac and used OmniGraffle to create the flowchart and Screenflow to create the video. It was more laborious than I had expected because Screenflow limits the size of annotations, and I was using white box “annotations” to produce the faded effect over parts of the flowchart. Otherwise it’s an easy program to use. I used a Zoom digital recorder to record the audio separately. Sometimes I feel like I should be a trainer and sometimes a problem-solver. This chart encourages me that my current training designer job offers me both roles! If the “training” request turns out not to be a training solvable, I can put on my problem-solving hat and suggest a non-training solution. Thank you for the flowchart which makes complete sense and follows on from many of your previous ideas. I have a continuing dilemma which is that many companies say they need safety training. A project I’m working on, the client wants an “awareness course”. Alarm bells went off in my head as this can be very “unmeasurable” and make for boring eLearning. I suggested a scenario-based activity where a worker is proceeding through a typical activity and the required awareness is exhibited through the scenario. They didn’t like it as they have many different departments who do this task differently – they couldn’t agree on a “process” to use for the learning. Also, they are planning on doing process specific training for particular employee groups after the awareness training, so this is “awareness only” and targeted at all employees. It is obviously a company legal compliance issue in that they need to show that they have provided training on this topic. So in the end, we’ve ended up with what I think is boring eLearning and my question, to myself and to you is how do we teach “awareness” with no measurable performance indicators? Hi Mike, it sounds like you’re in a tough situation and one that’s unfortunately common. Usually I’d suggest that you say, “Let’s say that I’m watching Bob and Jane work. How can I tell by looking at them that Bob is aware of X and Jane is not?” But it sounds like the client wants the awareness material to be delivered to an audience that does many different jobs, which puts you in the least enviable position of all: you’re supposed to deliver a vague “awareness” message to an audience that’s so broad that you’re not allowed to focus on specific behaviors. It might help to question the separation of “awareness” from the second wave of process-specific training that the client is planning. If they had been willing to fold “awareness” into “process,” then they could have avoided the separate, generic “awareness” stuff completely, and you could design meaty scenarios that test both process knowledge and awareness of X. For some more ideas that may or may not be helpful, you might see What to do if they just want awareness. Lucid and charming presentation, as usual. It’s a little ironic that I left technical writing for instructional design, only to see Instructional design yearn for more tech writing (er, job aids)! I agree with the mixed bag approach of course, and part of the beauty of your presentation is its simplicity. But I was a little surprised to see only “realistic simulations” as the next and only option under motivation. I would suggest changing this node to something more general like “Is motivation a serious problem” , then if yes “can training help improve motivation?” then if yes the arrow to the design activities box. A realistic scenario is of course a great way to deepen the learner experience, but certainly not the only activity available. Thanks for the post. Bradd, thanks for your comment. The “design activities” box is intended to be 100% interactive activities, rather than presentations or anything else. So the line from “motivation” to that box means, “We can design interactive, cognitively challenging activities that will improve their motivation.” For me, about the only option for that is realistic simulations, in which the consequences of not doing the necessary thing come naturally from the decision not to do it. Other media traditionally used to “motivate,” such as presentations in which leaders exhort us, or videos showing horrible accidents, aren’t “activities” as I define them. I have trouble imagining fact checks that would motivate, or a T/F quiz that would motivate, or anything else like that. I think that video exhortations and similar materials are internal marketing projects, not training, although I realize this isn’t a common stance. It sounds like the flowchart or the materials accompanying it need some clarification about this. Joe Harless’s version of “help me understand the problem” was “tell me more about your TPS problem,” a variation that’s definitely traveling in the same direction you are. And small wonder. Like Joe, your focus is on helping the client produce value, not on delivering training. You use the standard decision = diamond symbology of flowcharting, but have an overall pyramidal shape in the diagram. The absence of strictly horizonal and vertical arrows gives this, I think, a beneficially unstructured look. It doesn’t seem like an engineering process; it seems like a guide to thinking. Cathy this is GREAT! Within the first five seconds of your video, I wanted to yell “Finally, someone gets it!” Every meeting I am in, I hear “That needs to be put in a training document,” or “The staff needs training.” And just from the discussion, I already know that a document and/or training won’t solve the real issue. I look forward to reading more of your post! Note: I just set up my blog, so there is nothing posted yet…..I should have something to view within the next few days. Thanks! Cathy, What is the best way to introduce this process in an environment that maybe a little resistant? I work in an environment that if the VP tells you to “put it in a training document” that’s exactly how you need to respond. They may understand business, but they definitely don’t understand adult learning or how to effective design instruction. Help!! Ivy, thanks for your (tough!) question. It might be helpful to play up your role as an outsider who has to quickly learn everything about the problem. “Let’s make sure I understand what needs to go into the training,” you could say, sounding like you have no doubt at all that training is the solution. In addition to using questions that ask what people are DOING that needs to change, you can also ask innocent questions like, “Do you think we could put a reminder in the software?” and so forth. Basically, the trick might be to position your questions as, “Help me understand” and not, “Hey, there’s a good chance that the training that you’ve decided we need isn’t actually necessary.” You could gently guide them through the process so they discover the better solutions for themselves. Good luck! Outstanding presentation, Cathy! I’m going to post this on the LinkedIn Groups I help manage. great post. I love the flowchart. I love how clear you’ve made this. However… you mention in the example fixing some of the problems by changing the data entry screen — adding a pop-up that shows the XR codes for example. Sometimes the challenge is that making these types of changes (direct changes to the software) are beyond the control of the instructional designer/performance consultant. So, although it would be ideal to make an environmental change, it just isn’t an option. I’m not saying you should give up and turn away from pursuing the environmental change, I’m just saying that you have to take into consideration that it may not be possible. Will, thanks for your comment. I agree that often we have no control over the software, in which case we would have to find another solution. For example, if we can’t make the software easier to use, it would become a knowledge or skills problem and we’d go down one of those branches. For example, we could say it’s a knowledge problem because people don’t know the procedures for using the software (because it’s badly designed). We could end up making job aids to walk people through the trickier aspects of the software and also give them lots of practice doing the stuff they do every day so it becomes natural in spite of the software’s poor design. Could you define cultural problems? I found confuzed on this node. And i think motivation node could also has correlation with culture. Shen, thanks for your question. By “cultural problems” I mean aspects of the company’s internal culture, such as how managers treat employees, whether the company allows people to have flexible schedules, how much work each employee is expected to do, how well they’re paid, etc. A classic example: A company thought that they needed ethics training because some employees were falsifying their performance data. They originally planned to provide training to those employees. However, as they examined the situation, they saw that the employees who were falsifying data were under a huge amount of pressure because their bosses had nearly impossible expectations of their performance and didn’t give them much support. This was a cultural problem. Instead of training the employees on “ethics,” they designed training for their managers to change the macho culture and make the managers more supportive. I agree that the motivation mode can have a lot to do with culture, and I’ve revised the flowchart to make that clear. In the first version of the flowchart, someone could say, “Our employees lack motivation! Let’s train them!” without examining WHY they lack motivation. I’ll link to the revised flowchart in a separate comment. Thanks! Hey everyone, I’ve updated the flowchart to clarify stuff at the “motivation” node and to suggest what to do if the problem is environmental but can’t be solved. Click here to download the new flowchart. Thanks for your comments and please feel free to add more! 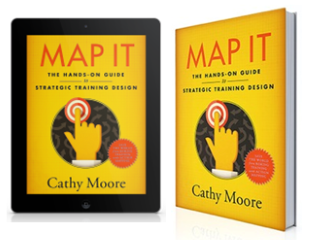 Hi Cathy, have been a fan of your approach for a while, this is a really helpful resource to help us get out of the training/course development mindset. Like how you emphasise a consultative approach (getting the client to come to the conclusion themselves through targetted questioning). Found the vid walkthrough very helpful for understanding how the flowchart could be applied. Thanks!! Hi Cathy, I love this explanation! Can I show this in a company training session? Tanya, yes, it’s fine for you to show the video during your training session. Thanks for asking! Thnx, as usual, for the structured approach to the common dilemma “Whether training is the solution?”. Working as an independent freelance Instructional Designer, I am frequently faced with situations that pose this question. And, most of the times, it is not very common that the client appreciated your point of view. One such latest example is – one of the client’s had a conceptual course running, and they wanted an interactive game developed to reinforce the concepts learned. However, a game in that situation did not really seem to be serving the goal; and we explored some alternate interactions for the group which could really help the learners. After that session, the client just went into a rethink mode and the project was called off. After such incidents, sometimes, one wavers and thinks – should I just develop what they want and not lose out the business. But I guess, your post clarifies any such dilemmas, and re-motivates the solution provider within the instructional designer/training developer. Thanks for the help! I have also found a great website that teaches How to Make a Flowchart and I found it very helpful!